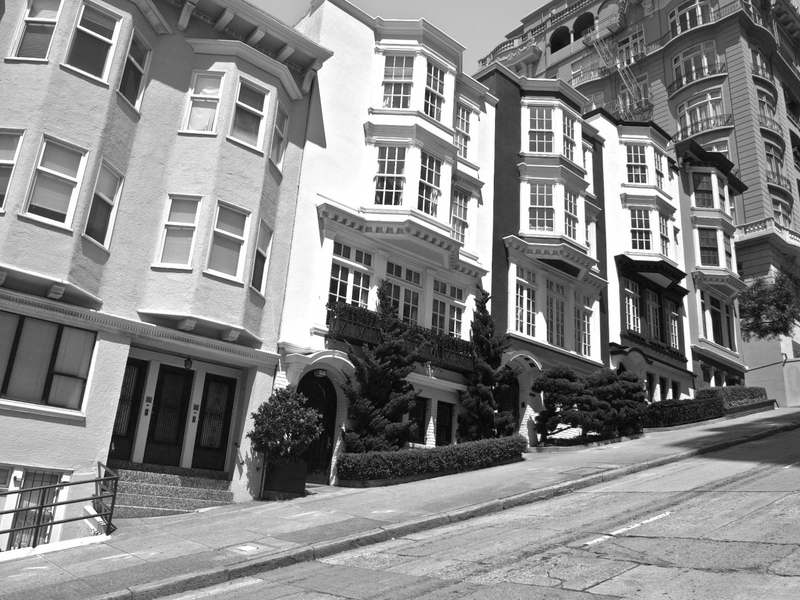 The very first post on this blog features a shot of these same buildings on Mason Street in San Francisco. When I had a chance to spend part of a morning in that city last week, I wanted to revisit the location and try again. That’s not because I am disappointed in that old photo. Indeed I believe it holds up extremely well, especially given my lack of knowledge, practice, and my inferior equipment. I happened, back then, to walk by this spot at a perfect moment for light and shadow and had the eye to recognize it and grab the shot. That magic was unlikely to appear for me again, especially as I knew I was coming to the spot at a very different time of day and year. Still, I’m glad I went. I shot this version from a different angle than the original, although I’m kicking myself a bit for cutting off the top corner of one building. That’s something I need to work on, as I’m finding it to be a persistent fault that should be easily avoided. I obviously went with a very different processing approach. I also shot from a few other angles, but I like this the best. When I took the first picture, I stood back on the sidewalk and there were some parked cars in the foreground. They are even more prominent on my attempts to recreate the exact the same shot recently, so much that I believe I must have been standing on something 10 years ago to get a higher elevation. Great shot! Love the leaning lines. Gives a pretty good sense of how steep that hill is. This is a great shot Mark! That hill is crazy steep! Love the composition and I really like the black and white tonality! That city has some serious architecture and I think you’ve framed it up pretty well! Hi Cassette. Please don’t get down on yourself. The best way to get over being frustrated with your photography’s to keep working on it. Good luck!